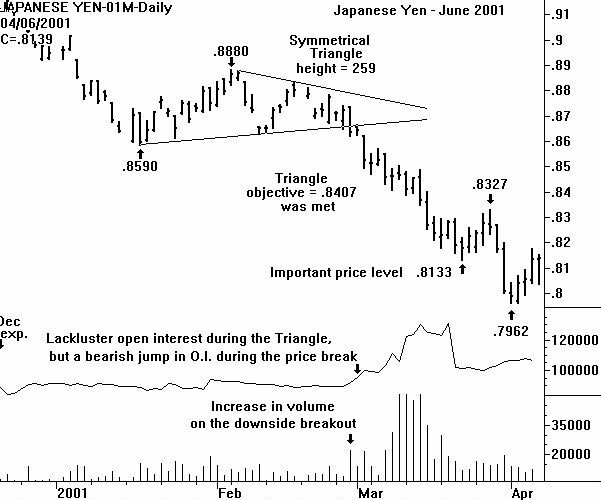 The most important price point on the IMM June Yen future is .8133. As discussed last week, this former price low could easily be identified as overhead resistance. The Thursday April 5 close was .8132 and the most recent close was only 6 tics higher. Obviously this support is in the process of being tested'. Not obvious is whether the support will stop the rally. Open interest considerations should aid in accessing the strength of the price rally. It is poor. The 79 tic rally (to .8132) was due to net short covering. Total Yen open interest declined 1,564 contracts. And volume that trading session was definitely not high - at only 12,816 contracts. CHARTWATCH expects the total volume (including approx. 2400 contracts during GLOBEX) to be less than 12,000. If so, this would be another bearish internal indicator. And, of course, declining open interest would mean more short covering. CHARTWATCH has seen short covering rallies in the Yen that have been very dramatic, quick, and vicious. But these normally begin with a relatively high level of open contracts. Such is not the case now. A disciplined approach to keeping a correct directional view is to conclude the Yen is bearish if Friday's volume was less than 12,000, open interest declined, and the June future is trading back down below .8133. If all three of these conditions are met, a short position with a tight protective buy stop just above .8151 (Friday's high) is in order. If the optimum bearish conditions are not met, a long position would only be held if Friday's volume surpassed 14,000, open interest increased, and the June future is trading above .8133. Then the support can be used to gauge the placement of protective sell-stops. Since there are no classical bar charting price patterns present, no specific measuring objectives can be sited.